The shapes and positions of plant cells are fixed by cell walls. Consequently, plant cells must be formed during development in the positions where they are needed, requiring exquisite spatial regulation of the cell cycle and cell division planes. We are studying mechanisms responsible for orienting division planes in plant cells. Much of our past work on division plane determination has focused on TANGLED, a protein that is localized at the division plane throughout prophase, mitosis and cytokinesis and functions to promote proper division plane orientation (Figure 1; Walker et al., 2007). Recent studies on TAN have elucidated requirements for its localization throughout the cell cycle, revealing that a series of distinct mechanisms involving different parts of TAN protein function to maintain TAN at the division site as cells progress through division (Figure 1; Rasmussen et al., 2011). These studies have shown that division site maintenance is plant cells is a more dynamic process than previously envisioned. Figure 1. Schematic of cytokinesis in a somatic plant cell. TANGLED protein (blue) co-localizes with the preprophase band (PPB), predicting the future division plane during prophase. Unlike the PPB, TAN remains at the cortical division site throughout mitosis and cytokinesis, where it functions to promote proper placement of the new cell wall. Maintenance of TAN at the division site requires different parts of TAN protein and different interacting factors at different stages of the cell cycle. Our current work focuses on orientation of asymmetric cell divisions. In plants, as in other eukaryotes, asymmetric divisions are associated with pattern formation during embryogenesis, establishment of new cell lineages, and the formation of specialized cell types. In all of these processes, developmental asymmetry is closely tied to division polarity, but little is known about polarizing cues that orient asymmetric divisions in plants, or how cells respond to them to establish asymmetric division planes. Our studies in this area have focused on the formation of subsidiary cells of maize stomata, which are created by asymmetric divisions of subsidiary mother cells (SMCs, Figure 2). We have discovered a cooperatively acting pair of receptor-like proteins, PAN1 and PAN2, that are implicated in transmission or amplification of a cue from adjacent guard mother cells that polarizes the asymmetric divisions of SMCs (Cartwright et al., 2009 and unpublished work on PAN2). ROP GTPases act downstream of PAN1 to polarize SMC divisions (Humphries et al., 2011). Ongoing work utilizes proteomic and molecular genetic approaches to identify additional components of the SMC division polarity pathway. Figure 2. Stomatal development in wild type and pan mutant maize. All stages are illustrated schematically; Toluidine Blue O-stained mature epidermis is also shown for wild type (top) and pan mutant (bottom). 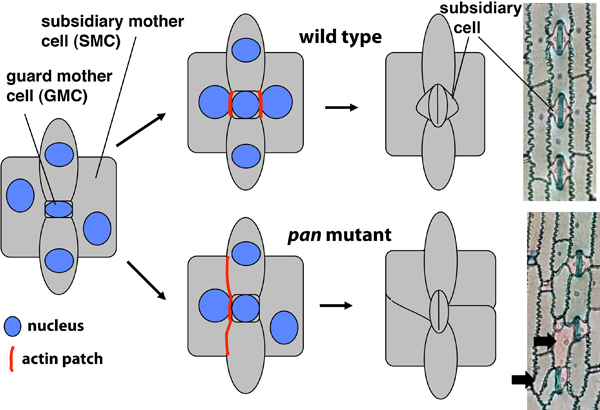 Subsidiary cells form via asymmetric divisions of subsidiary mother cells (SMCs), which are polarized by a cue from the adjacent guard mother cell (GMC). PANs function together with ROP GTPases to polarize premitotic SMCs. Facette, M.R., Park, Y., Sutimantanapi, D., Luo, A., Cartwright, H.N., Yang, B., Bennett, E., Sylvester, A.W., and Smith, L.G. (2015). The SCAR/WAVE complex polarizes PAN receptors and promotes division asymmetry in maize. Nature Plants 1:article no 14024. doi:10.1038/nplants.2014.24. Sutimantanapi, D., Pater, D., and Smith, L.G. (2014). Divergent roles for maize PAN1 and PAN2 receptor-like proteins in cytokinesis and cell morphogenesis. Plant Physiology, 164:1905-1917. Facette, M.R., Shen, X., Bjornsdottir, F.R., Briggs, S.P., and Smith, L.G. (2013). Parallel proteomic and phosphoproteomic analyses of successive stages of maize leaf development. Plant Cell, 25:2798-2812. Facette, M., and Smith, L.G. (2012). Division polarity in developing stomata. Curr. Op. Plant Biol., 15:585-592. Zhang, X., Facette, M., Humphries, J.A., Shen, X., Park, Y., Sutimantanapi, D., Sylvester, A.W., Briggs, S.P. and Smith, L.G. (2012). Identification of PAN2 by quantitative proteomics as a LRR-RLK acting upstream of PAN1 to polarize cell division in maize. Plant Cell, 24:4577-4589. Rasmussen, C.G., Sun, B., and Smith, L.G. (2011). TANGLED localization at the cortical division site of plant cells occurs by several mechanisms. J. Cell Sci. 124:270-279. Rasmussen, C.G., Humphries, J.A., and Smith, L.G. (2011). Determination of symmetric and asymmetric division planes in plant cells. Annu. Rev. Plant Biol. 62:387-409. Humphries, J.A, Vejlupkova, Z., Luo, A., Meeley, R.B., Sylvester, A.W., Fowler, J.E., and Smith, L.G. (2011). ROP GTPases act with the receptor-like protein PAN1 to polarize asymmetric cell division in maize. Plant Cell, 23:2273-2284. After receiving her Ph.D. from University College, London, Laurie Smith conducted postdoctoral study at Stanford University and the UC Berkeley/USDA Plant Gene Expression Center.